The Prep Wife: Big Decisions Coming My Way! Big Decisions Coming My Way! For somebody who loves to plan and is very organized, I'm really surprised that I have not started packing yet. We are leaving early in the morning tomorrow. All I've done is crowd a table with toiletries (half of which I probably do not need). I have OPS: Over-Packing-Syndrome. I think it's a syndrome. When packing, something happens in my brain. Some sort of neurological message gets sent and I get this strong urge to stuff everything in the suitcase so that I have the luxury of choice when on vacation. "Luxury of Choice" goes hand-in-hand with "Heavy Suitcase Problem". And of course, "Heavy Suitcase Problem" results in carrying or dragging that heavy weight and then crossing your fingers hoping that you do not get an overweight surcharge. Not very luxurious. Here is a wonderful song that will put anyone in a serene, summer mood. Just get yourself a nice drink (maybe a Mojito? Recipe below), hit play, sit back and enjoy the little journey. 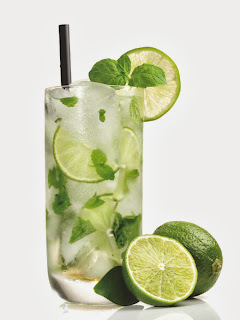 Place mint leaves and 2 lime wedges into a glass. Use a muddler to crush the mint and lime to release the mint oils and lime juice. Add 2 more lime wedges and the sugar, and muddle again to release the lime juice. Do not strain the mixture. Fill the glass almost to the top with ice. Pour the rum over the ice, and fill the glass with club soda or carbonated water. Stir and sweeten to taste. Garnish with the remaining lime wedges. Cheers! 2,857 Open Tabs.. Still Open!